Myanmar's leader has been fairly quiet about a mounting crisis within its borders, and the U.N. says time is running out. The head of the United Nations says he believes Myanmar's leader has one "last chance" to stop the mounting Rohingya crisis. "If she does not reverse the situation now, then I think the tragedy will be absolutely horrible, and unfortunately then I don't see how this can be reversed in the future," U.N. Secretary General António Guterres told the BBC. The current crisis began after Rohingya militants attacked police and military in the state of Rakhine. The military struck back. Refugees say the army has killed hundreds of civilians. 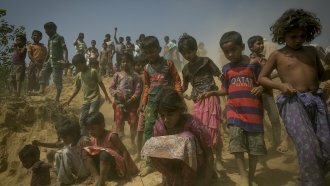 More than 400,000 Rohingya have fled their homes. But despite international calls for action, Myanmar's de facto leader Aung San Suu Kyi might not have much room to maneuver, politically. Suu Kyi is barred from being president in Myanmar. Instead, she's the country's state counselor, a position that effectively allows her to lead. The country was under the control of a military dictatorship for decades before it began to liberalize in 2011. But the military still has a lot of power in the country. It holds at least one-quarter of the seats in Parliament and can control its own budget. Plus, it isn't used to taking orders from outside its ranks, and that puts Suu Kyi in a tough spot. Perhaps a larger problem is the growth of Buddhist nationalism within Myanmar. The International Crisis Group notes that radical Buddhist groups have been on the rise since 2011 and with them, an increase anti-Muslim hate speech. The largest of those nationalist groups is the Association for the Protection of Race and Religion. The government has made efforts to get the country's top Buddhist authority to ban the group, but many of its supporters see it as the country's best chance to defend Buddhist ideologies in a time of immense change. There's concern that that growing power of Buddhist nationalists could box Suu Kyi in further and that efforts to crack down on the groups could lead to more violence. Suu Kyi has been considered a human rights icon for more than 20 years, but on the issue of the Rohingya, she's mostly had a history of silence or denial. In a 2013 interview with the BBC, she said there was no ethnic cleansing happening to the Rohingya. That's despite a Human Rights Watch report released months earlier that said otherwise. Most recently, Suu Kyi decided not to attend the U.N. General Assembly, claiming the current crisis is being distorted by a "huge iceberg of misinformation."